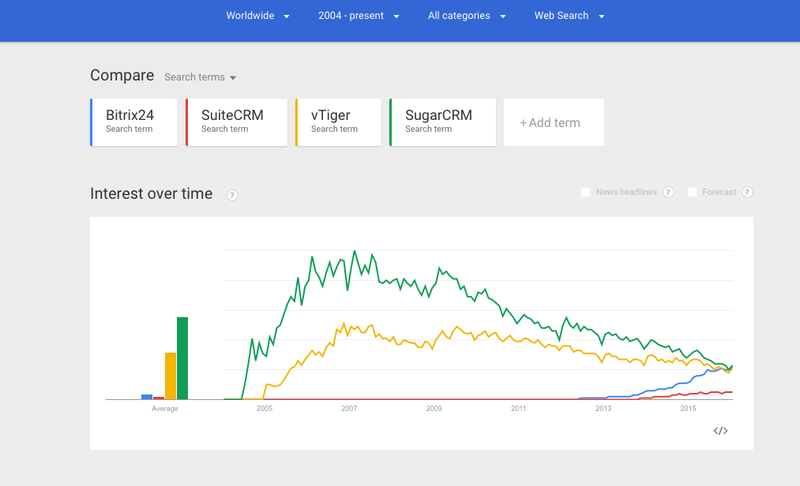 What Happened To Open Source CRM Anyway? I first wanted to sensationalize the title a bit and call it ‘Why Open Source CRM Died’. That’s not entirely true, as many open source CRM systems are alive and kicking, but it certainly would grab people’s attention, because I think it’s a very interesting subject. But let me first start with a Google Trends slide. I’ve shown it what feels like hundred times, typically to folks who want to be our CRM partners, saying that the graph demonstrates how quickly Bitrix24 grows (last year we grew close to 300% and that’s from a very considerable user base). And then one day a person on the other side replied that to him it showed that open source CRM glory days were over more that Bitrix24 was growing fast. Ten years ago, heck, even five years ago, there were a lot of vendors that were convinced that they’ll make an open source CRM solution that’ll kill Salesforce. A few dared to actually to publicly make this prediction. But we know now that Salesforce biggest threat comes from Zoho, not SugarCRM, vTiger or any other open source solution. So what’s going on with open source CRM and why is that open source solutions dominate some niches, like content management systems, but not this one? First, you have to understand what ‘open source’ means. No, I am not taking about Wikipedia definition but rather what clients, vendors and partners are wishing for when saying ‘open source CRM’. To end users ‘open source’ means free — almost no exceptions. It’s not about source code or idealistic world views or desire to customize software, it’s about not paying anything. That’s where the problems start — first, you need a server. Then you need a person who can install it on your server. Then you need a person who can customize CRM for you — and this costs money. Small business owners who typically search for free CRM simply don’t have the technical skills to do it themselves and once you find out that open source CRM consultant will charge you $100/hr, many decide against open source and choose cloud. This is exactly why ALL fastest growing CRM solutions that come with generous free plans — Bitrix24, Zoho, Insighly — are cloud based or at least give you option to use free cloud and purchase self hosted version that comes with full source code. That’s how we do it anyway. Let’s consider what ‘open source’ means to vendors. To them it means ‘we’ll save a bunch of money on marketing and developers’. Of course, this never materializes, but the thinking is because open source solutions are technically free, people will recommend them to each other and you won’t have to spend money on ads or at least you won’t have to spend as much. There’s also hope that their community will quickly develop a ton of integrations and add-ons so the vendor won’t have to devote their developer time on those. What’s ‘open source’ to partners? To them it means ‘we’ll get something for free and then sell it to our clients’. Very few partners find a way to create useful add-ons and make good money selling them. Most partners simply make money via deployments and customization. If you go to any open source CRM forums, you’ll see partners and clients demanding that the vendor adds a feature they want, rather then doing it themselves. The problems with open source CRM model became impossible to ignore with the mobile revolution. Clients demanded to be able to work with their CRM via iPhones and Android based devices and vendors would reply ‘that’s what our partners are for’. Partners would eventually release the apps and without fail they’d get dismal scores in appstores. That’ because partners would create the apps that handled only part of the functions of the entire CRM, the one that they new best or that they had a client. Partner had no idea what the vendor was working on next, or which protocols would be changed in the next release. Go to Google Play and search for ‘vTiger’ or ‘SugarCRM’, then read the comments for the apps created by partners. The fact that official apps were released 2–3 years later than they should have been made a lot of difference. The time was lost. There were better solutions on the market. To their credit, leading open source CRM vendors understood that the model is broken a few years ago. They first limited open source license to the community edition and eventually stopped using open source model altogether, providing source code only to clients that pay. They stopped hoping that their community would have as much enthusiasm or altruism about their CRM as they do for Linux. They lost a few partners, but that’s probably for the better too. Partners who sell don’t really care if software is open source or not. So that’s where we are at now. Does this mean that Salesforce, Microsoft Dynamics and few others will continue dominating the niche? They may, or they may not. I can only talk about Bitrix24 strategy, since we are committed to free CRM and knew that open source model doesn’t work (that’s why we give source code to our commercial clients only). We hope to beat Salesforce by using the same model as mobile game developers. Most of the popular mobile games are free, but they come with an option for in-app purchases. Likewise, our CRM is entirely free — the only limits are 12 users and 5GB. Everything else — CRM records, quotes, invoices, tasks — are unlimited. We offer free email marketing. Sales automation tools inside our CRM are free as well. So, how do we make money? What ‘diamonds’ can you buy inside Bitrix24? First, there’s telephony. Unlike other CRM systems that require integrations, you can call from inside Bitrix24 right away. All you have to do is to deposit $10. Our rates are dirt-cheap (1–2 cents per minute for most locations). This may seem like a small thing, but over 120,000 phone calls are made or received via Bitrix24 a day. Those pennies really add up. Then you can rent local, toll free or foreign phone numbers (Bitrix24 telephony is supported in 43 different countries). We charge typically $6-$11 per number per month and close to 4000 numbers have been rented out. Again, $250,000-$500,000 per year ain’t bad. If you want to connect your PBX to Bitrix24, that’s $49/mo. You can record phone conversations in Bitrix24 for free, but if you want to listen to more than 300 calls a month, you have to subscribe to our Bitrix24 Plus plan. It’s only $39/mo for 24 users. Most CRM systems charge $39/mo per user, but we aren’t complaining, because we are selling several hundred ‘Pluses’ each and every month. Another cool mil’. People pay us if they want to have external user access for their Bitrix24 account. They pay us if they want to insert company logo. They pay us if they want to restrict access to their Bitrix24 account by IP, so that their employees can access it from the office but not from homes. This is why we can give away our CRM, have 2–4 major releases a year and pay to 100+ developers. This freemium system works for us, as Google Trends chart shows. It also works for our partners, because unlike other software vendors who expect their partners to bring clients to them, our partners don’t have to do any prospecting — we supply them with 100% of the leads, because we don’t do any installations, integrations or customizations ourselves, as soon as clients contact us for that, they are immediately referred to partners. I am not entirely sure if other CRM vendors are feeling the pinch or not. Zoho used to have only 3 free users for their CRM, but they now have 10. Was it because of our success, or was it an independent decision to better compete with Salesforce? I have no idea. I do know that open source CRM is dead for all practical purposes. Even though I chickened out from putting it in the headline. P.S. After finishing the post, I realized that I garbled up the freemium part a bit. So just for the record, I believe that freemium model will dominate the CRM market in a relatively short time span, say 3–5 years. I would not be one bit surprised if Google came out with free CRM this or next year. Unlike Microsoft who has Dynamics and billion dollars in sales to protect, Google doesn’t have anything like that. What they do have is Google for Work which never took off as they expected. Google can afford to give away free CRM, because it WILL help them sell a bunch of GfW services and dominate small business market. And once the big boys start giving away free CRM much like they do with cloud storage, there won’t be a way back. There are just too many players who’d love to disrupt CRM niche, especially Salesforce. If that happens, most current CRM vendors will die out. It’s probably going to happen to task and project management solutions as well. That’s why we think it’s a good idea to get a few years of head start and forced ourselves to be profitable with the freemium model. I am the Chief Marketing Officer of Bitrix24, worlds fastest growing free communication and collaboration platform.